Having victoriously crossed into France, the Austrian army is in high spirits. Feldmarschall Krakowski commander of 2. Armeekorps has halted his command for a long needed rest. His men have also outrun their supply train and the country side will not long sustain them. The wagons have all just arrived at la Chaussee where Krakowski has established his headquarters. The division commanders have sent out cavalry patrols to the west and southwest to find any French forces that might still be in the vicinity and determine their intentions. The news is not good. An hour ago, Feldmarschall Bartenstein reported a French cavalry screen in the vicinity of Vertus. From some high ground just west of Vatry, his cavalry reported seeing a long dust cloud stretching to the west. No doubt this represents enemy infantry on the march. The direction of march could not be determined. At almost the same time, Feldmarschall Klenau also sent word that his cavalry was met on the road outside les Petites Loges by an extremely large light cavalry force. His patrol estimated its size to be more than one regiment strong. Now word has just arrived from Feldmarschall Ulm's headquarters telling of a large concentration of French infantry just entering Rheims. With no enemy cavalry shielding the column, Ulm's patrol was able to make a reasonable estimate of the size of the enemy force. It is reported to be no fewer than 3 very large brigades, no doubt accompanied by artillery. No cavalry was thought to be present. The patrol commander has estimated the number of infantry to be in excess of 10,000 men. It is becoming clear that the French are moving over a large front. It does not appear that they are aware, as yet, of your exact disposition. That will likely change within the hour. Given the situation, you decide you must get your supply train away and to safety. Arrangements are made to turn it around and move it back east out of harm's way. In the meantime, your Korps must delay the approach of the French until the wagons are safely off. Delay the French as long as possible. They must not enter la Chaussee for 3 hours. This will signal that the supply train has been successfully moved out of the general vicinity and no longer under threat of capture. The Austrians are on the field eh? why play this battle? ... The French will never dare to attack! There is always the remote possibility they don't want ice cream men in the country. I just realized Kevin and I were talking about different crossroads for our initial deployment. Watching the replay, I just can see a French isolated unit moving to the objective, I guess the curaissiers that were sitting there when I arrived. They were there for about 15 minutes. Enough for us to lose the battle. I blame SJ for not holding up twice his number of rabid Frenchies for 3 hours. I enjoyed the battle immensely. I was put into a rather awkward position by our C-in-C with some conflicting orders ("Maintain contact with Pepe to your south and do not leave a gap." "Now go north towards SJ" [which would leave a gap toward which fresh French troops were approaching from my SW] ), but on the whole it was an excellent fight. I was more than holding my own in the centre until SJ collapsed on my right so I fell back as well which cost me a battalion in the withdrawal but our final position at "the Alamo" in a loop of the stream with deep steep banks on three sides allowed the corps to halt and throw back the French. Fighting a retreat though against an overwhelming enemy is great fun and I wish we had more scenarios like this. We need the practice of doing it as well. I think the evil scenario designer meant for our right to cave in since it was by far our smallest division and was facing the biggest French force. In hindsight we should have contracted our front significantly as soon as the battle opened to ensure all three divisions were in physical contact somewhere east of Chalons. There was an excellent ridge running E-W there for SJ to hold plus open flat ground for my division and a stream bordered by woods for Pepe. I think we could have stopped the enemy there as long as we kept our cavalry out on the respective open tips of the horseshoe to prevent enemy getting past us to the objective. Thanks for such a teaser Kevin. Its a scenario I'd like to play again. I will however mention Pepe's valiant stand in the south - having been deprived of the stronger of his brigades. He fought off a powerful enemy with minor losses - as always, Pepe is my trusted right arm in combat - if I manage to get him to go where I want him to be - he will literally take on anything and everyone wherever he is ! I went forward with a cavalry squadron. You can see it in the replay although unfortunately the replay file shows all units as infantry. My position, while it was on highish ground had an extremely poor field of view to its front blocked by a sizeable wood and a town. Only as I went around the south side of the wood and saw movement inside it (I saw horses legs just under the trees and wondered why the hell my cavalry squadron had decided to go through the wood) when moments later a mounted French officer rode out! The wood and town behind it were full of enemy. I then pulled back to my lines and was approached by 10 squadrons of hussars and chasseurs. I only had 4 cavalry squadrons so committing my cavalry brigade to drive them away would have been fruitless so I proceeded to send infantry forwards in square to shoot them away while bombarding from long range with my guns. To get rid of these opponent took at least 30 minutes, during which time my right was initially in contact with SJ (again, check the replay) but as is natural in these things, he drew his left in towards his centre and I drew my right in towards mine, each of us to contain the threats to our front. Later on the order to swing north to help SJ was impossible to obey as a gap would have been created on my left. I saw the single enemy infantry battalion move between SJ and I but I was stuck well out front dealing with my opponent. I did in fact order two cavalry squadrons to go after it but by the time I saw it, it had a head start on me and I could not catch it. Pepe was indeed a long way away and I assumed he was fighting hard from the outset and unable to move north to close the gap. One of the biggest issues with HITS play is the incomplete picture. Your post Roalnd shows that you made a series of assumptions about what I was doing and the enemy to my front and despite me telling you what I was doing you chose to disbelieve my reports and issue me conflicting orders. I naturally, knowing the situation better that you, told you I couldn't do what you told me. In HITS you have to work on the basis that you cannot know what is going on everywhere and you have to rely on what others say to be be correct even if your brain is telling you otherwise. 1) Confusion over initial deployments. Kevin and Pepe did not agree which crossroads they should be holding and Pepe did not move north to contact me. 2) HITS and FOW. Be aware all is not what you think. 3) Division frontages. I suspect Kevin designed the scenario with the intent of causing us to struggle in exactly the way we did. We were over-extended to begin with and it got worse when each division commander naturally closed his division up to concentrate effort on his immediate opponent. I like to work a division on only a single brigade frontage (or two brigades if it has 3) this way when unexpected events occur you have the force to counter it without contracting your front. One of our casual play problems is we have no consistent army doctrine on how we should deploy divisions - we all do what we want. If there were a doctrine on how to deploy these issues would be mitigated to an extent. The fact I was deployed on a 2 brigade frontage at the outset meant I could not be flexible at all in response to an enemy approach. Moving my northern brigade north would have opened up my centre. 4) Lack of a reserve. A 4th division that consisted of just a single brigade of 4 sqdns of heavy cavalry under the C-in-C would have won us the day. We play far too many games without a correct structure and we do need a reserve for the C-in-C to use in dire situations like we had in this battle. 4) by the time more and more troops appeared to your front I knew you wouldn't move for real any more and so I stopped trying to get you to move - having stopped trying to get the others to move... SJ was told early on to "retire towards Digby in case you are overwhelmed" - we covered why he didn't after the battle - fair enough! Therefore I would only like to ask players to communicate with each other and to never fight alone any more, unless specifically ordered to do so! If that means giving up a bit of good terrain - so be it- I'd rather fight in the swamps but fight with my flanks covered than fight on a ridge line and be all alone - outflanked in minutes! If I know that players will cooperate without the CinC telling them to do so - excellent - half the couriers will disappear from my HQ to the front line! This battle was not one that the Austrians could win by defeating the French. They outnumbered us by 30% and had a huge advantage in cavalry numbers. Rather it was to be a battle of delay. I tried to impress that on the players by giving accurate reports from cavalry reconnaissance, no locals with wildly inflated numbers this time. The French were also known to be advancing on a very wide front so several approaches had to be covered. We also knew the enemy was very close. In fact the enemy shows up in the south and center within 10 minutes of the game start. I found during play testing that with minor adjustments, the ground our units started on allowed each division to successfully hold off the French for nearly an hour in the center and north. 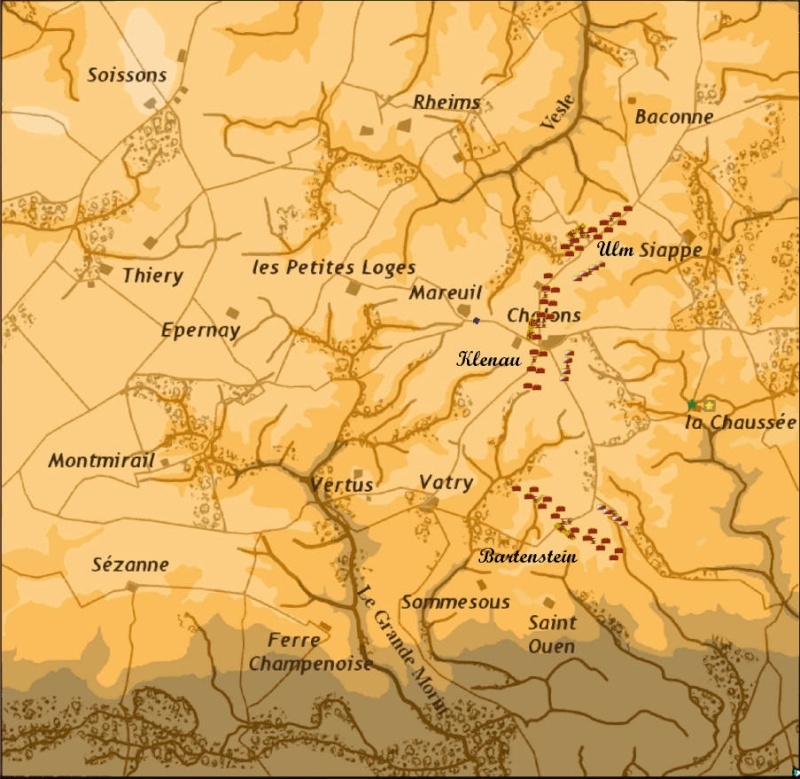 Then a steady fighting withdrawal to Chalons, where the two divisions could unite, and finally to la Chaussee would run out the clock and allow the wagons to get away. This was possible because I made the French commanders fairly defensive and they would hold back a large portion of their divisions as reserves feeding them into the battle as necessary. Of course moving forward and attacking them would cause French commanders to use their entire force at once. That's what happened in the north even though we knew the enemy was in excess of 10,000 men there. In the south, the Austrians significantly outnumbered the French but were of much poorer quality. They could hold them back the entire day unassisted if necessary. If they fell back, I found that the French in the south often sent a brigade north to help out in the center and that was always overwhelming. That wooded area did not block my LOS to SJ. I could always see his units from where I was. I'll repeat the point that once in action both SJ and I shrank the frontages of our divisions to fight our respective opponents. This is not our fault; its just how SOW battles are fought. Even if SJ and I remained stationary a gap would always have appeared. The duty of closing that gap is neither SJs nor mine but yours and the only way to achieve it would be to have us both fall back. As it was my right remained stationary and my left advanced about 400 yds and SJs whole division moved away from me. Even before things began to get serious you told me "SJ has found a good position, move closer to him". I could not do that with a centre division in a line without making a gap. We've discussed this already. I was told not to leave a gap. SJ should have moved towards me or we both should have gone back. You told neither of us to do either of those things. I think there is when I get given silly orders that contradict the agreed plan and you get upset when I give you the reasons I can't follow them. If I tell you "I can't do that, I am engaged to my front" I expect to be believed. It's not like I'm making things up and scuppering a game deliberately! I deal with a HITS situation almost every day - the Austrian army does not have real time satellite images on the front lines, and I don't even have a horse to sit on and get a better view from. I don't know what point you are making. It sounds like you're suggesting that your day job somehow entitles you to be right. Maybe that isn't what you meant by writing the above but its the message I am picking up from your words. Either way, what you say doesn't wash with me. Every battle is different, whether its a real training exercise or a HITs SOW game and no-one can claim to have a greater knowledge or skill in anything. What matters is what is said and done on the day - each day being different. I told you about the Bavarians moving NE! I was observing them expecting them to cut into the gully on my right front to attack my right. I didn't want to set my right in motion and be hit while I was repositioning when I was already on excellent ground. When you saw 5 to 6 squadrons you were only seeing half of the force I was facing. Even I didn't know it was as big as it was until I saw the replay. As I said before (I'm getting somewhat tired of having to tell you everything twice) there was a wood and town to my front that concealed much of the cavalry. I could see a gun or two beyond as well and had concerns there could be infantry back there as well. My 10,000 men were not doing nothing - they were holding the ground I was ordered to hold. I can't hold a line a division frontage with a brigade while exposing my left to cavalry and so on. You were not where I was but a good way behind me - at least you were whenever I turned to look that way. You were probably 200-300 or more yards back. The view of the enemy for me was changing every few seconds because of the weird ground slopes. Whole enemy squadrons would vanish 100 yards in front of me only to pop back into view if I moved a few yards. I was also inside a wood much of the time having to deal with enemy cavalry who were happily able to charge into it. Very annoying. You and I just perceived this battle differently. Those two perceptions does not make me wrong and you right. This is what I meant by FOW and having to accept what a subordinate says. I think you're getting too philosophical here, at least for me! We are casual amateur players of a game and not professional soldiers. We aren't paid, we don't drill and - as I said before - we don't have a doctrine which could cover among other things division deployments and frontages. Therefore I would only like to ask players to communicate with each other and to never fight alone any more, unless specifically ordered to do so! If that means giving up a bit of good terrain - so be it - I'd rather fight in the swamps but fight with my flanks covered than fight on a ridge line and be all alone - outflanked in minutes! If I know that players will cooperate without the CinC telling them to do so - excellent - half the couriers will disappear from my HQ to the front line! Again I think you are losing track of the fact this is a game and people get their buzz from it in different ways to you. We might have the same 4 or 5 people playing a lot during testing but newcomers and less frequent players will always come along to play. All our games will always have an ad-hoc approach to the problems we face. In fact most of our scenarios are specifically designed to screw us up, presenting us with difficult situations that armies rarely face, because 90% of stand up fights are rather dull tactically and we are being given the unusual and varied (and long may it continue that way! ), so there is hardly likely to be a situation we can treat in any kind of standard way. Perversely, for me, if that began to happen I may begin to lose interest in the game! we'll just leave it at that - but you are quite right in some of the points you mention and I will have to draw the consequences - gives me more time for other things on the weekends! They were there for about 15 minutes. Enough for us to lose the battle. Very sad that a wandering or marauding battalion or squadron can decide a battle like this, to avoid it we should ask for an organized force to meet the victory conditions. Something like a 1,500 or 2,000 strong force, with a commander off course. And many thanks for your praise Roland, I don't diserve it at least this time. Except... my men were facing an enemy. He was not imaginary - I was fighting him! A couple of hundred yards beyond what I could see, who knew what was there. I didn't, you didn't... it would be foolish to move men who are serving a valuable function towards a position of unknown utility requiring an open-ended period of time to complete that mission. EDIT: Yes, Pepe, it was frustrating but I suppose we can consider it as a squadron that broke through SJ's lines and was probably pursuing stragglers when it found our baggage and stopped to loot it. In the case of this particular game it does make some sense. The exact same thing happening in another battle might not. This is why these games are so interesting. People have a completely different opinion of the battle based on what they can see. Everyone also interprets his orders based on the situation in front of him. It's no wonder the AI often ignores what we think are perfectly reasonable orders. It does nothing different than we do. In retrospect, I made mistakes. I did recognize my mistakes and have learned from them. I should have told our CnC of my problem (pulling back/repositioning while engaged) he could have advised me during the game. It's not easy to play CnC, yet we need a CnC and I respect that. You mean orders you give or orders given to you? My question was for Mark.